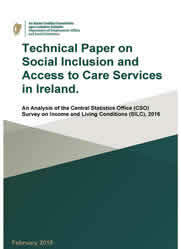 Technical Paper on Social Inclusion and Access to Care Services in Ireland. This report uses the special module on access to services from the Irish SILC data for 2016 to examine differences by social risk group and social class in access to care services. These include childcare and care for people with an illness or infirmity and the services may be publicly or privately provided. Social risk groups include: lone parents, people with a disability, young adults, children, working-age adults and older adults. The ESRI investigates the contribution of this approach to the measurement of access to services. They also examine the association between access to these services and both poverty and employment. They comment on the implications of the results for social inclusion policy and highlight some measurement issues with this approach to capturing group differences in access to services. The analysis shows that most children under the age of twelve are cared by their parents and less than one in five families are using formal childcare services. Disadvantaged families with children are more likely to report unmet needs for formal childcare, most often due to an inability to afford them. The ESRI notes that the need for home care services is greatest among older adults and those with a disability. Older adults who need this service are much more likely than those with a disability to be receiving professional home care services. However, the level of unmet need for professional home care remains high across all social risk groups, mostly due to the unavailability of services rather than affordability. In the case of childcare there is a stronger relationship between poverty and access to these services than in the case of access to home care services. Finally, while there is some suggestion that the lack of access to childcare services may constrain women’s labour supply, the report did not find clear evidence of such constraint in the case of home care. The technical paper is an output of the Department’s research programme with the ESRI for the Measurement & Analysis of Household Income & Living Conditions (MAHILC). We want our website to be as informative and as easy to use as possible. We would appreciate any feedback you can give us about any aspect of our site. Please read our accessibility statement.